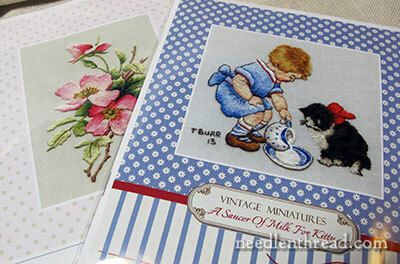 Needle Painting Embroidery Kits – Winners Announced! I’m excited to announce the two winners of last week’s give-away of four of Trish Burr’s beautiful needle painting kits! I was sliding the kits into packaging so they’d be ready to mail quickly (I hope the winners get them before Christmas! ), when it suddenly occurred to me that they really should be wrapped and bedecked with bows. And so, two of you are going to receive nice little packages you can slip under the tree for yourselves – or … you can just tear ’em open and launch right in! It’s hard to pick just one, so I picked three. In order, these are my favorites. The sweet peas because I love sweet peas, the French Rose because it is so beautiful and the bee eater or the kingfisher because I think they are amazing. I guess I picked four! LOL! Thanks to you and Trish too Mary! Happy Holidays! Hi Mary! I’m drawn to the projects that have reds in it for some reason and I like the French rose and the basket of pansies and the anemones. The reds are so rich. I like the sweet peas too and would probably try them before i ever tried something like the French rose. Thank you for the chance. And thank you for the daily newsletter. It wakes me up every morning before heading to work! Congrats, Sylvia & Lora! Please do contact me with your mailing address so I can ship these off right away! Fingers crossed, they’ll get to you before Christmas, unless you live overseas, in which case, hopefully they’ll arrive shortly there-around. Thanks so much to all who participated! I’ll be running a couple more give-aways in the next couple weeks, right around Christmas. One involves a light (ahhh… light!) and the other? Two beautiful kits to go along with two beautiful copies of a book (signed by the author!) that I recently reviewed. Fun! So keep an eye out for those! Tomorrow – goldwork! – and a strange fluke. and my hearty congratulations to Lora and Sylvia. Reading through the replies it,s interesting to see how many particularly love a certain, thing or place because of some heart tugging nostalgia. Trish’s designs mostly draw us into remembrances of the past and most modern day people are more than happy to be given a lifeline to former. memories. Looking forward to coming posts. Cheers, Kath. Congratulations to the lucky winners. Nothing like a new needlework project or two to brighten up the holiday. And Mary, now I’m wondering what the strange fluke is all about. This is as much fun as reading a mystery novel. Congratulations ladies. What lovely prizes. Thank you for hosting such a fabulous giveaway. Congratulations Sylvia & Lora hope you enjoy your kits! A big thank you to all of you for participating and for leaving your lovely feedback it has given me a huge lift and much insight. A special thanks to you Mary. Happy Christmas to all. Congratulations ladies, enjoy your kits. Next Next post: Mission Rose: Goldwork Outer Frame – Slow Progress. And a Weird Fluke!